One of my favourite things to do is look at the earth from above. My beloved book provides daily aerial photographs of both natural and human-altered landscapes. Following Chris Hadfield on Twitter makes my world a better place. I spent eight months of my life as a satellite imagery analyst, chasing dragon-shaped plankton blooms. “Aisle or window seat?” isn't even a question. And don’t even get me started on the pigeon camera...! Seemingly removed, reflecting on our planet from way up high provides a unique perspective not offered when grounded in day-to-day life. 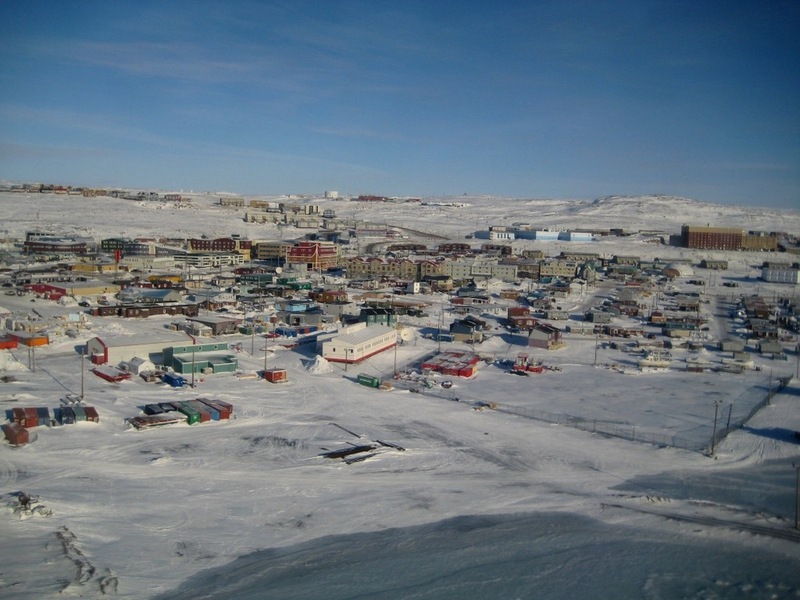 A few weeks ago, Anubha and I were asked what our first impressions of Iqaluit were when we moved north. There were the obvious ones: the temperature is damn cold, the landscape is vastly treeless, the language is beautifully unfamiliar. However, my most startling realization didn't occur when I initially landed in Iqaluit, or even during the week that I was here. Rather, it happened when I left. Peering out the window of a 737, I looked down at the unique little community. After several days of acquainting myself with a previously foreign place, I was able to recognize the obvious landmarks: the Qamotiq building, the igloo church, the 8-storey. I felt somewhat comforted by a vague familiarity. Then, with a further rise in elevation, everything changed. All association was lost. A thousand thoughts crossed my mind: Who were the resilient peoples that brought us here? Where is everything? Beyond these unrestricted city limits, how vast is this emptiness? How can such a place really exist? How reliant are we on the outside? Electricity. Heating. Furniture. Vehicles. Produce. Milk. Cheez Whiz, for crying out loud. And how did northern lifestyles become so contemporary? Now, whenever I fly, I anxiously await to relive that moment. It will never be as startling as that initial realization, but it still humbles me in some small way. Little city lights and a whole lot of white. You don’t realize how remote you are until you’re in the air.